"In a No-man's Land between North and South, You didn't fight for the Blue or the Grey... You fought for your friends and family." 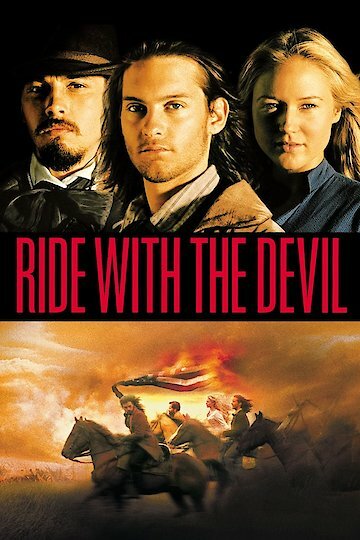 The film entitled Ride with the Devil tells the story about the lives of two friends Jake and Jack and their experiences during the American civil war in Missouri. It all begins when two best friends Jake and Jack are exposed to the events during the American civil war for the first time in their lives. During the war, Jack’s father gets killed by some Kansas demonstrators known as Jayhawkers and as a result of this the two friends decide to join a group of First Missouri Irregulars called the Bushwhackers. While in the group they come across famous Daniel Holt who was once a slave and George Clyde who released him from slavery. A fight sets out between the Jayhawkers and the Buskwhackers with both groups making use of guerrilla warfare tricks to fight against each other. During the confrontations these four guys usually take refuge in a building owned by the Evanses family. While there a young widow known as Sue starts developing feelings for Jack however, their relationship does not last as jack suddenly dies. After Jack sustains gun shots and some deadly wounds he dies from the pains. Roedel decides to take Sue to the Brown’s family house for safety reasons. Shortly after, a group of Bushwhackers led by William invade and destroy a female establishment and prison where guerrilla relatives are kept. The fights between the Bushwhackers and Jayhawkers get more serious after the attack and many people get killed as a result. Sue later gives birth to a baby girl and all the people in the area think it is Roedel’s child but wonder why they are not married. Roedel then decides to marry Sue and adopts her daughter as well so as to keep them safe from other men who wanted to molest her since she was single and helpless. The film was written by James Schamus, directed by Ang Lee and produced by James Schamus, Robert Colesberry and Ted Hope. Ride with the Devil is currently available to watch and stream, buy on demand at Amazon, Vudu, Google Play, FandangoNow, iTunes, YouTube VOD online.